Since 2003 Boston Organics has been dropping off totes of carefully selected organic products at our home. We have busy lives, reside in the heart of the city and don’t have a car. 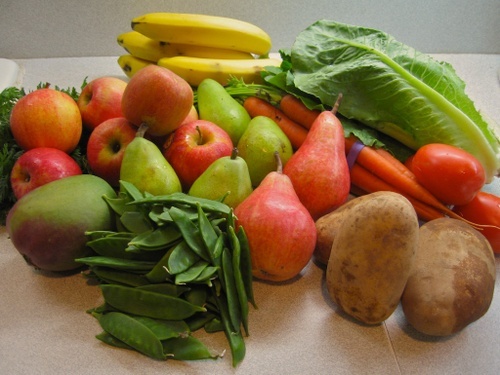 Services that deliver are important to us and Boston Organics delivers – in every sense of the word. Here’s what was in our box this week. You sign up on-line, choose the size of your box, weekly or bi-weekly delivery and the mix of fruit and vegetables you prefer. Then you check a list of the items you never want in your box, and items you would like to substitute. In this part of Boston, they deliver on Tuesdays. We just make sure our empty tote is where the driver expects to find it, and we come home to find a new supply of fresh, organic goodies. Over the years, Boston Organics has added optional items that customers can include in one or all their orders. Their current bulk “add-on” section offers carrots, oranges, potatoes, and onions. Beyond produce, you can include Nashoba Brook Bread, Taza Chocolate, Dean’s Beans Coffee, Equal Exchange Coffee & Teas, Organic Farmstead cheeses, Organic eggs, Teddie Peanut Butter and Simple Soynut Butters. They also hunt down seasonal specials. Right now, they are offering Vermont Maple Syrup and Pickles. In the past two summers we have added fantastic 5 lb. boxes of organic wild blueberries from Maine to a few of our orders. This week’s flyer promoted Taza Chocolate Gift Boxes for anyone who wanted to do their Valentine Day shopping with the click of a mouse. Other holidays will bring related special offerings. If I want to do some shopping on my own, before the tote arrives, I can go online and see what is likely to be in my Boston Organics order. In the summer, when I shop the farmer’s markets, I switch to all fruit for my delivery order and I redo my lists to receive mostly fruit that is not grown in Massachusetts and therefore will not be at the markets. If we will be away, we email them and cancel our order for that week. You can do that weeks ahead-- when you schedule your plans. Obviously, we are very happy with Boston Organics or we would have dropped it long before now. I think I’ve called a small problem to their attention two, or three times in the 4 years we’ve been with the service. Each time I was thanked for letting them know and “make good” items were in my next order. There have been a few discussions of the service on the Boston Area board at Chowhound.com and most of the folks there are pretty satisfied too. You can search the Boston board to read the details. Over at Yelp.com they have a four out of five star rating with 26 reviews. If you love ripe, runny versions of bloomy goat cheeses like Humboldt Fog or French Bucheron and you have a taste for truffles, head for the cheese department at Whole Foods on Westland Avenue in Boston or River Street in Cambridge. In the past week, both stores were cutting wonderfully ripe wheels of Cypress Grove’s newest cheese-- Truffle Tremor. Imagine Humboldt Fog with truffles blended into the paste, and you have this lovely addition to your cheese plate. I’ve been taking small slices out of the refrigerator each afternoon to warm into lovely, soft piles of flavor that we scoop up with a spreader by dinner time. Like Cypress Grove cheese maker Mary Keehn’s award winning Humbolt Fog, her Truffle Tremor begins as a dense flaky goat cheese. As it ripens, a creamy, buttery layer begins to form inside the rind. When fully ripe, it becomes a triple treat as the flavor developes from tangy in the flaky center, to powerful in the buttery layer to potent as you take a bite of the ripe exterior. The truffles specks throughout the cheese complement without overpowering it as sometimes happens with a truffled cheese like Sottocenere. This is an expensive cheese, but I would rather has a tiny taste of a great cheese than a large block of an average one. Ask your cheese monger for a taste to see whether Truffle Tremor is special enough, in your opinion, to justify the price. 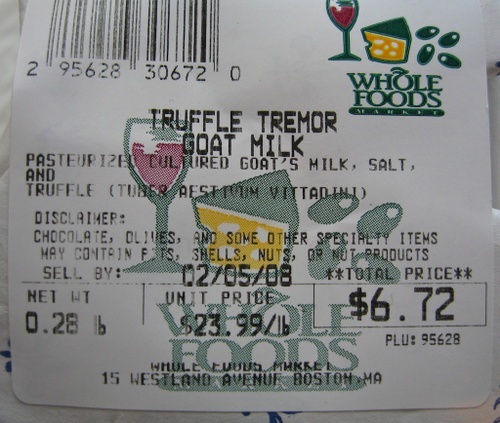 I called Formaggio Kitchen in Cambridge and Russo’s in Watertown to ask if they were carrying Truffle Tremor. Formaggio said they don’t carry any Cypress Grove and Russo’s said, “not yet.” Please leave a comment if you find it elsewhere and let us know what you think if you try it. What's on your food lover's shopping list? Shop Amazon for all your kitchen & dining needs. and support this site! Here is what some respected cheese folks have had to say about this cheese. Finally, at the Cypress Grove site you can download a detailed sheet with serving suggestions, wine pairings, nutritional information and instructions on how to care for the cheese. Here's the label with the details from my January 29, 2008 purchase. 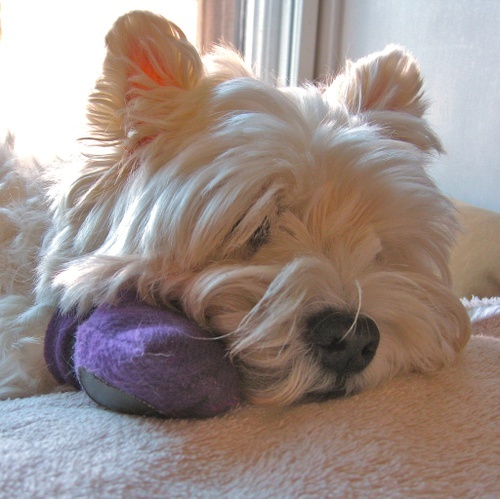 Maggie Mae is sporting a bright purple bootie today to keep her from licking at a sore paw. We thought we would take this opportunity to share our tip to keep your own dog from licking a paw. Ed spotted a little hot spot on the top of Maggie Mae's paw. If allowed to lick it, she'll turn that small spot into an infected foot. The great team at Back Bay Veterinary Hospital on Newbury Street taught us how to deal with hot spots, and we will head there for professional care if this does not clear up quickly or if Maggie shows any signs of fever or infection. Today we shaved off the surrounding fur, cleaned the paw with antiseptic and applied an antibiotic ointment with a bit of gauze and a wrap of a special pet bandage that clings to itself. We topped that with one of her vast collection of boots that did not hold up to outdoor use. While I can't recommend this model to protect paws from salt in winter, I do find them useful for first aid protection. ******While many of the items in a human first aid kit can be used for a pet, there are a few specialized goods – like a fast read rectal thermometer and special bandage for fur covered skin– that you might need.Here are a few items that come in handy around here for pet first aid. As always, we recommend only items we use ourselves or that have been highly recommended by someone we trust. For central Boston residents, getting places without owning a car is fairly easy. Add a 50-pound dog to the trip, and you need a bit more planning. But, there are ways you can take your pet to an appointment, for a visit across town, or a weekend away. Walking is a favorite activity for most neighbors with dogs. You can solve your most common dog transport issues by choosing a veterinarian and groomer within walking distance. With 24-hour notice, Fetch Four-Legged Limo will take your pet (with or without you) to appointments, play dates, or to the airport. When you have to travel, they can see that your dog gets to a boarding facility and back. Fetch owner, Terry Riccio, can even stand in for you at veterinary appointments. “If the owner can’t go, I’ll take the dog to the vet, and I’ll have the vet call the owner and tell them what’s going on with their pet,” Riccio said. If you want to drive, most car rental companies don’t have restrictions on pets and are another option. However, these companies have hefty cleaning fees if they have to remove a lot of dog hair, and they will charge you if your pet damages the car. A crate for a large dog can take up a lot of space. 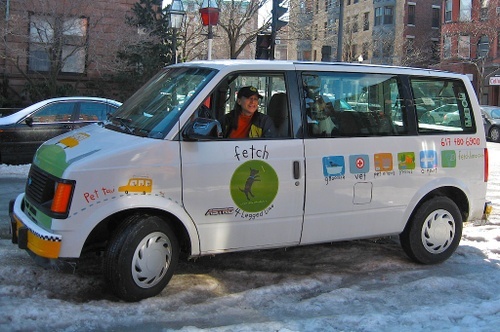 Fortunately, the Zipcar fleet includes models that are perfect for big dog transport. Curtin recommends a Honda Element for a large dog crate or an easy-to-load SUV for a smaller one. For a car-free option, the MBTA welcomes pets aboard, outside of rush hours. However, transit drivers are allowed to use their discretion. A happy little puppy is more likely to pass muster than a snarling 80-pounder. During rush hour you can only ride with service animals, certified therapy dogs, and pets in carriers. “The agreement [between the MBTA and the community] that was reached over a decade ago, did balance interests and created a good policy that allowed the T to meet its goals and allows pet owners in Boston to use public transportation with their pets,” said Kara Holmquist from the MSPCA. She recommended using a carrier or if you have a large animal, bringing your own blanket or towel to cover the seat. This will prevent shedded fur or muddy feet from soiling the cab seat and the clothing of the next passenger. For a weekend getaway, Boston Harbor Cruises to Provincetown and Cape Air’s service to the Cape and Islands are pet-friendly. The other major local carriers, Amtrak and bus operator, Peter Pan/Bonanza accept only service animals. Finally, for the ultimate in luxury, you can reserve a traditional limo or car service. Having a driver at your disposal to help with baggage and hold the doors allows you to relax and really enjoy the ride with your best buddy. Lois Harvey’s morning commute is a stroll through the heart of the neighborhood she serves. However, it’s a stroll punctuated by stops to chat with a volunteer, answer a neighbor’s question, and pick up litter. For the next few hours Harvey, the office administrator for the Neighborhood Association of the Back Bay (NABB), responded to messages and calls. “I’m a people person.” “I do like the idea of being a resource for people.” Harvey said. A NABB member called asking advice about a storage box that was reducing visibility at the entrance to an alley. “Sergeant Harvey,” as she jokingly called herself, donned her coat and went to take a look. Back in the office she delivered a precise description of the situation to Sita Smith in City Councilor Mike Ross’ office, listened to the response, and called the member with an update. An interesting series of careers developed a set of skills that serves her well. Harvey began as a teacher. Today she educates people about NABB and the historic neighborhood. From teaching she transitioned into educational publishing at Houghton Mifflin. She uses the writing, editing, advertising, and design techniques learned there to prepare NABB’s newsletters and print material. Next, she followed her entrepreneurial instinct and became a partner in a promotional products company. The time management and multitasking abilities developed to succeed in business are perfectly suited to a neighborhood association with a tight budget. 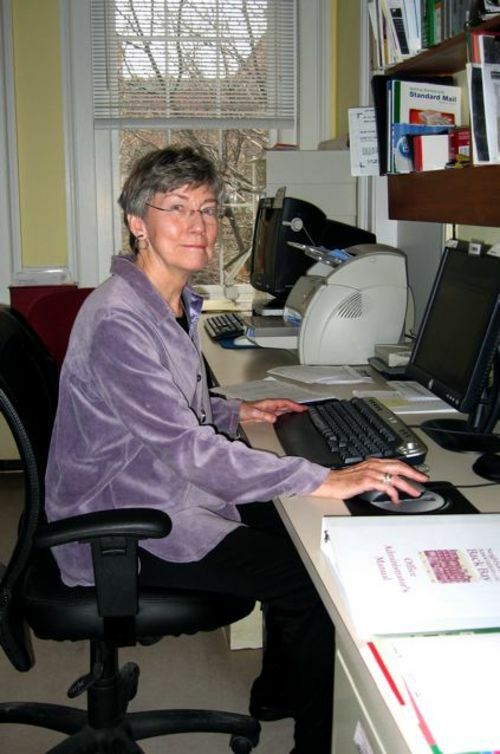 She learned about the staff side of non-profits with a stint at Historic Boston. However, her friends at NABB needed an office administrator who understood the organization. Harvey had been a board member and committee chair. “They twisted my arm just hard enough for me to say yes, and I have enjoyed the job more than I ever anticipated,” she said. Preparations are currently underway for NABB’s “Taste of the Back Bay.” While Harvey is quick to heap praise on “a huge committee of very dedicated people,” she admitted that it’s a busy time for her. This event is vital to the organization and provides funding to support the NABB office. “This year I’m particularly pleased that Wachovia Securities is the presenting sponsor. This is an organization that I’ve had a personal relationship with for many years, and so it was a joy to see them come on board,” said Harvey. The NABB office is the connection point for approximately 1700 members, 20 operating committees, and more than 100 key volunteers. “It’s important to remember that everyone except for Lois is a volunteer. She’s the one we turn to for continuity and understanding what is going on in multiple committees.” “She is my lifeline… I just love working with Lois,” said NABB President, Manya Chylinski. That feeling is reciprocated. “I have been absolutely overwhelmed by the quality of the people who contribute to this organization,” Harvey said of NABB volunteers. Article and photos by Penny Cherubino was published in the Back Bay Sun in March of 2007. 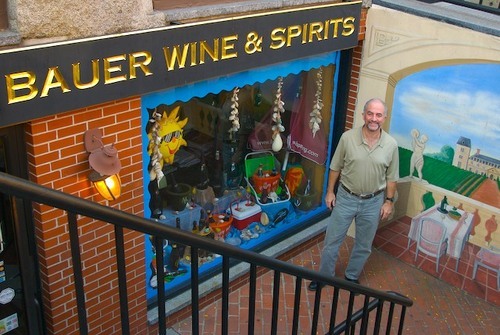 In 1980 Eric Bauer made a great decision when he hired Howie Rubin to work in his Newbury Street wine store. Today, Rubin is the person people see as the face of Bauer Wines. 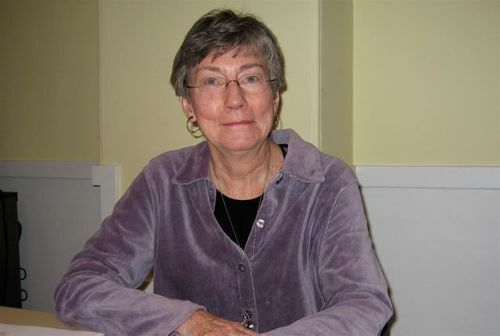 Rubin has served as teacher, resource, friend, and merchant to Back Bay wine lovers for 27 years. The Bauers had been in the fine wine business since the 1950s. Back then, Eric’s father, Frederick, sold wine door-to-door to the carriage trade from Boston to the North Shore. He built a loyal and sophisticated customer base. Bauer Wines has changed owners three times during Rubin’s tenure, but with his guidance the company continued the tradition of service established by Frederick Bauer. “The soul of the store remains the same... the same way of doing business –not door-to-door any more, but it’s still personalized service, great selection, building people’s palates and teaching them how to pair food with wine, ” Rubin said. Rubin rounded out his wine knowledge when he was selected to be a sommelier at the Breakers Hotel in West Palm Beach, FL. In this more formal setting he learned about European wine. Simultaneously, he taught them about American wines and placed a few of his California favorites on their list. When he first moved to Boston, he worked at “A Bunch of Grapes,” a small wine bar in Quincy Market. There, he had the pleasure of serving Julia Child “an enormous amount of Burgundy.” That experience and a later party in Bay Village where he introduced Child to the joys of watermelon margaritas and chatted with her about wines, stand out in his memory. “It was the highlight of my vinous life,” said Rubin. From wine, conversation moved to other topics. “She traveled a lot, had good friends, rented villas, and would be gone for three weeks in Italy. And, I’d be off on my little jaunts and be back and we’d exchange stories,” he said. Last truffle season the Rubins and their friends bought a couple of truffles, and Carol cooked a four course meal based on truffles and great wine. Update 12/24/17 : Another update with a few tweeks to the recipe noted. This time our oven is full of a leg of lamb in this sauce. This is my take of a recipe that appeared in Gourmet in January of 2003. In this photo they are served with cheesy cheddar Polenta. Here's a link to the Polenta recipe. You'll need a heavy Dutch oven with an oven proof cover that is large enough to hold the lamb. I use the Le Crueset 6.75 Quart Oval French Oven . 1-2 cups of hot water or more if needed to cover shanks. * Onion: sometimes I put the onion in quartered- I like the pieces in the sauce. Try it that way if you like. 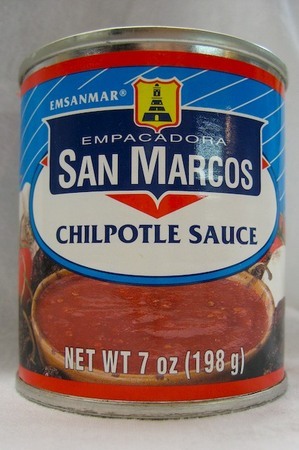 ** Chipotle sauce: be sure it is the “sauce” NOT the “Chipotle in adobo.” That would deliver one hot dish - far too strong a flavor. Whole Foods Markets carry both. For other sources contact the manufacturer. Here's a photo of the can you want. *** Maple syrup: use the dark, rich grade B if you can find it. Trader Joes and Whole Foods both carry it. 1. Arrange oven racks to fit your pan and preheat oven to 325°. 2. In a large, oven proof pan, brown the lamb shanks in canola oil. 3. Use tongs to assist you to sear as much surface of the lamb as possible. Do the meat in batches and don’t crowd the pan. 4. Remove lamb from the pan. 5. Remove all but a thin covering of oil from the pan with paper towels and your tongs. 6. Add the chopped onion to the pan and cook 3 minutes, add the garlic and stir for one minute. 7. Place the browned shanks back in the pan and fit the carrots in around the lamb. 8. Mix the braising liquid ingredients with 1 cup of hot water. Pour over the lamb and carrots. Add more water as needed to almost cover the lamb. Bring to a strong simmer on top of the stove. 9. Cover the pan with aluminum foil and then a heavy oven proof lid doing your best to seal the pan completely. 10. Put the pan into the oven and braise for 3 hours. 11. At the two-hour point, carefully unseal the pan avoiding the steam and gently turn the shanks. Reseal and return to the oven for the last hour. 12. Remove the lamb, carrots and large pieces of onion (if you opted for them) to a warm, serving bowl and cover. 13. Strain the braising liquid through a sieve into a clean pan. 14. Degrease the braising liquid by skimming the fat (or you can sieve it into a gravy separator and then pour it into the pan.) Put the pan on the stove top and reduce the liquid by about one third. Since you are increasing the power of the chipotle as you reduce, so taste as you go. Pour the thickened sauce over the lamb and serve. Serve with: Polenta or mashed potatoes, green beans, and crusty bread. Put some of the braising liquid in a gravy boat for those who would like to pour more on their potatoes or polenta. Wine suggestions: We conducted a wine tasting with this dish. Four tasters tried: a Cote du Rhone, a Zinfandel, a Malbec, a Nebbiolo, and a California Bordeaux Blend. The Cote du Rhone was the clear favorite. Note: This dish is even better if made a day or two ahead and reheated for service. That makes it perfect for entertaining or to have something prepared for a busy week. To Reheat: Preheat your oven to 350 degrees. Reheat lamb with all the liquid and carrots in a wide shallow roasting pan. Try to allow space between the shanks for even reheating. Cover tightly with foil and use an instant read thermometer to be certain the lamb is heated through. It should take 45 minutes to an hour to reheat from refrigerator temperature. Leftover tip: Strip the lamb from the bone and shred. Simmer for 45 minutes or longer in the remaining liquid with one or more cans of your favorite beans for a very flavorful chili. We like a mix of pinto and black beans, and I always add the left over and onion carrots cut into bite size pieces. Variation: I wanted to make this recently and found my butcher out of lamb shanks so I tried making it with a whole leg of lamb. It was terrific. I increased the braising liquid ingredients by half again. That would be 3 cans of sauce, 1.5 cups of coffee, 3/8 cup of maple syrup, juice of I.5 lemons, and salt, pepper, and hot water as needed. If you use a leg of lamb, ask the butcher to cut the bone off at a point where it will fit in your pan. Do take that extra piece of bone and toss it in the pan to give off it's goodness. Credit for the original recipe: This is my take of a recipe that appeared in Gourmet in January of 2003. Here’s the link to the original recipe.